Rivera after his inning, the 4th, v Pirates at The Boss, Mar. 20, 2012, ap. 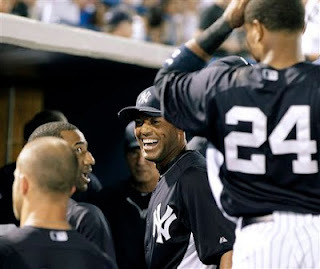 He's usually expressionless after pitching but here he's obviously laughing about something. I happened to see his inning on tv. His last out was an infield pop-up that 2 or 3 people tried to catch and fortunately one did (I believe Arod). However the scramble went down, something about it made him laugh quite a bit so he may still be laughing about it as he's entering the dugout. Same as above, 3/20/12, ap.